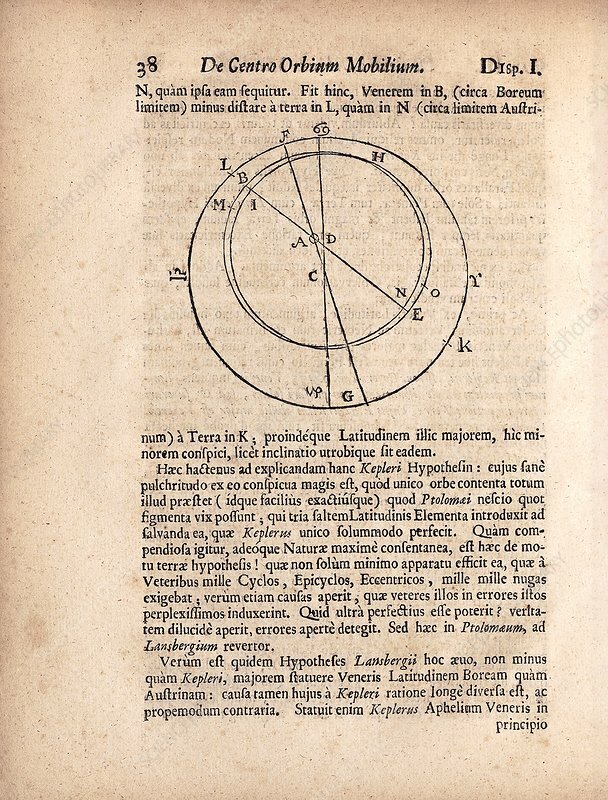 Orbital mechanics of Venus and the Earth, 17th century. This page is from 'Opera Posthuma' (1673) by English astronomer Jeremiah Horrocks (1619-1641). Horrocks worked with his friend and fellow astronomer William Crabtree, using Kepler's Rudolphine tables to predict when Venus would pass in front of the Sun's face. Horrocks observed this transit on 24 November 1639. He observed several other astronomical phenomena, including irregularities in the orbits of Jupiter and Saturn, and a lunar occultation of the Pleiades. He also made a study of the variations of the tides before his untimely death at the age of 22. This collected edition of their work and correspondence was published by the Royal Society, with lunar tables based on the theories of Horrocks contributed by the future Astronomer Royal John Flamsteed.